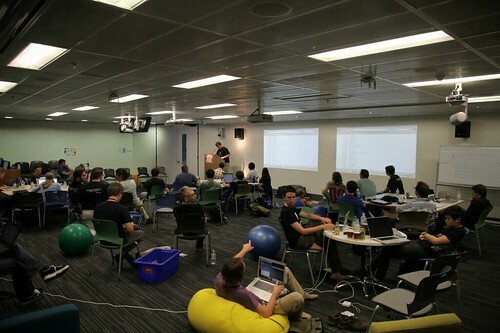 Come and join Henare, Tim and Matthew in their basement, er.. we mean Google Sydney, for an awesome weekend of hacking. It’s all a bit last minute. What’s the worst that happens? Nobody turns up and the three of us spend the weekend hacking. That’s okay too. However, it would be much more fun if you came too! We’ve got a couple of quick talks lined up to warm you up and give you some inspiration, then a full weekend dedicated to hacking on everything OpenAustralia. Come along and learn, share and build interesting things in and around open data, open government and civic hacking. 16:00 – Stop hacking, start presentations – show us what you’ve build, fixed or learnt! Google are kindly supplying the venue, power and WiFi so all you need to do is bring along your notebook, some snacks to keep you hacking through the day and pizza money if you’re a hungry hacker come Saturday evening. This entry was posted in Announcement, Development, ElectionLeaflets.org.au, OpenAustralia Foundation, OpenAustralia.org, PlanningAlerts.org.au, Projects and tagged civic hacking, Google, hackfest, oahack, open data, open government, openaustralia foundation, scraperwiki, scraping, Sydney, Sydney Hackfest. Bookmark the permalink. Post a comment or leave a trackback: Trackback URL.